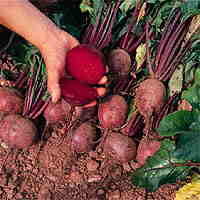 Beetroot is quite easy to grow, you may find the page How to Grow Beetroot on the Allotment Garden web site helpful. Boil in 6 pints of water for about 15 minutes for young beets, longer for older beets which are tough. Strain, discard the beets, and put the juice into a fermenting bin. Chop the sultanas or raisins and add to the bin along with half of the sugar. Allow to cool and then add the lemon juice, wine yeast, nutrient and tea. Cover and allow to ferment for a week, stirring daily. Boil the remaining sugar in 2 pints of water for 2 or 3 minutes and add to the bin. Cover again and leave for 3 or 4 days. Pour carefully into a gallon jar, leaving as much deposit behind as possible. Rack, as necessary, and syphon into bottles. Makes around 1 gallon of wine. Generally this is a fairly fast wine and the flavours have developed after six months to a year. You can get away with using a little more beetroot but too much throws the balance off and spoils the taste. It’s a shame to waste the beetroot and it can be eaten or broken into freezable portions. Those living outside the UK (where it is not allowed under regulations) can also use the cooked beetroot in chicken mash or pig feed. Why discard the beetroots after cooking them? I preserve mine and use for salads, etc. Thoroughly wash the vegetables. Do not remove the tops and bottoms as the beetroots will bleed out then put them into cold water and cook them whole. When cooked, remove them from the water and allow to slightly cool. The skins will slip off then the beetroots can be sliced, diced, or left whole if small, and preserved ready for using in salads, etc. They contain a lot of iron. I’m preserving my beetroot also .I mean i’m making 5 gallons of wine that’s too much Beetroot to waste. Could also make beetroot chutney. Beetroot also helps lower blood sugar among many other health benfits. So if i drink too much of the wine it’s healthy anyway haha.